San Francisco Beer Week kicked off over the weekend which means the 15th season Pliny the Younger is finally upon us. Many of our Russian River die-hards already know that the impressive new Russian River facility in Windsor, CA is now online, which means more retailers and store shelves have been graces with the iconic Vinnie Cilurzo’s beloved brews. What does this influx of Russian River beer mean for Pliny the Younger? For starters, the expansion allowed for 350 barrels of Pliny the Younger to be brewed this year, more than double last year’s 160 barrels. This increase in capacity opens up the opportunity for wider distribution. While we are are unsure of what percentage will be shipped out, we do know that Pliny the Younger will see distribution in California, Oregon, Colorado, and Philadelphia towards the end of February. For the first time, California’s Central Coast will also see the Younger pop up. Both the Windsor, CA production facility and the original Santa Rosa brewpub have the 10.25% triple IPA flowing thru February 14 currently with the greater Bay Area and Northern California seeing glimpses of Pliny this week at various SF Beer Week events . The Full Pint greatly appreciates any tips you submit in the comments below. As it’s early on in the Pliny season, we’ve listed some retailers who have been graced with the Younger in year’s past and we’ll update with confirmed events or tappings as we see them come in. – The Bistro (Hayward): Confirmed for Double IPA Fest on 2/2. – The Trappist (Oakland): Confirmed seen on tap on 2/7. – Holy Water (San Francisco): Confirmed on 2/5. – BeerCraft (Novato): Confirmed on 2/4. – Ale Arsenal (San Carlos): Confirmed on 2/4. – Old Sonoma Public House (Sonoma): Confirmed on 2/4. – O’Brien’s Pub (San Diego): Three confirmed events. The first event is at 2pm on 2/9 (first come, first serve). The second event is at 5pm on 2/12. And lastly, on 4pm on 2/13 tickets will be available for the 100% Charity event on 2/23 which will benefit the Inner North Star PTSD Retreat Center so please try and support this worthy cause ($25 per ticket for a 10-ounce pour, limit 2 per person while supplies last). – Trail House (Santa Rosa): Confirmed on 2/4. – Boiler Maker (Campbell): Confirmed on 2/7. – Taplands (Santa Clara): Confirmed on 2/7. – Toronado (San Francisco): Confirmed on 2/4. Multiple kegs, still on tap as of 2/6 at 11:45am. Still seen on tap on 2/18. – Hamilton’s Tavern (San Diego): Confirmed on 2/18. – City Beer Store (San Francisco) – Confirmed sighting on 2/5. Multiple kegs reported. Still seen on 2/18. – Mohawk Bend (Los Angeles): Confirmed on 2/17. – Tony’s Darts Away (Burbank): Confirmed second keg was on tap 2/17. – Lucky Baldwin’s Pub (Old Town Pasadena) – Confirmed event for 2/23. – Lucky Baldwin’s Trappiste Pub (Pasadena) – Confirmed event for 2/24. – Lucky Baldwin’s Delirium & Cafe (Sierra Madre) – Confirmed event for 3/2. – Tustin Brewing Co. (Tustin): Confirmed on 2/17. – Good Karma Artisan Ales (San Jose): Confirmed on 2/7. –Ladyface Ale Companie & Brasserie (Agoura Hills): Confirmed on 2/18 for Russian River Week. – Hollingshead Deli (Orange): Confirmed on tap on 2/18. – Live Wire Bar (San Diego): Confirmed on 2/7. – LowBrau (Sacramento): Confirmed on 2/18. – Amnesia (San Francisco): Confirmed on 2/7. – Original Gravity Public House (San Jose): Confirmed on 2/7. – The Hog’s Apothecary (Oakland): Confirmed on 2/7. – Smoking Pig BBQ (San Jose): Confirmed on 2/7. – Diving Dog Brewhouse (Oakland): Confirmed on 2/7. – Mikeller Bar (San Francisco): Confirmed on 2/7. – Grape & Grain (San Mater): Confirmed on 2/18. – The Local Peasant (Sherman Oaks): Confirmed on 2/18. – Neighborhood (San Diego): Confirmed on 2/18. – Pi Bar (San Francisco): Confirmed on 2/17. – Encinitas Ale House (Encinitas): Confirmed on 2/17. – The Hop Grenade Taproom & Bottleshop (Concord): Confirmed on 2/18. – Paso Robles Brewing Co. & Pour House Tap Room (Paso Robles): Confirmed on 2/17. – Capitol Hop Shop (Sacramento): Confirmed on 2/17. – San Pedro Square Market Bar (San Jose): Confirmed on 2/17. – Zeitgeist (San Francisco): Confirmed on 2/17. – Haberdasher (San Jose): Confirmed on 2/17. – Cato’s Ale House (Oakland): Confirmed on 2/17. – * A reader commented about Eureka Burger but we cannot verify which of the many locations will receive it. Any helpful intel is appreciated. – Falling Rock Tap House (Denver): 5 Confirmed events happening here. Doors at 11am and tapping at 1pm. – Hops & Pie (Denver): Confirmed event on 2/19. Tickets available at 11:30am, beer taps at 1:30pm. – Euclid Hall (Denver): Confirmed tapping for the week of 2/18. 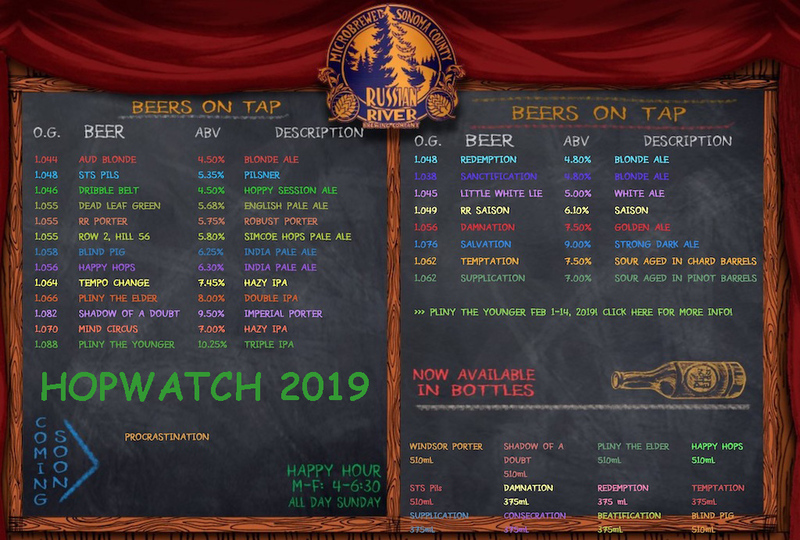 – Walter’s 303 (Denver): Confirmed Russian River event on 2/14 with Younger plus other beers. – Backcountry Pizza & Tap House (Boulder): Confirmed on 2/17. – FreshCraft (Denver): Confirmed event on 2/15. Tickets available at 5pm for a 5:30 tapping. A portion of proceeds to charity plus additional Russian River brews. – Choice City Butcher & Deli (Fort Collins): Confirmed on 2/18. – Parry’s Pizza (Northglenn): Confirmed event on 2/17 at 10am (12pm tapping). – The Mayor of Old Town (Fort Collins): Confirmed on 2/18. – Bull & Bush Pub & Brewery (Denver): Confirmed on 2/18. – The Barley Tap & Tavern (Steamboat Springs): Confirmed on 2/17. – Barrels & Bottles (Golden): Confirmed on 2/17. Slow Hand BBQ: received, conducting lottery which is now closed (2/13). Rose & Crown (tapped keg 2/11). Kinda late to the game but just heard that a new place in Ojai (Ventua County) CA is going to have it on the 23rd! Can’t believe you didn’t mention Eureka! A bunch of their locations get it. Haven Gastropub (Orange) isnlisted twice. Fathers Office in Culver City and Santa Monica. FYI – Wine Affairs is listed twice, and the San Jose Harry’s Hofbrau closed earlier this year. pFriem Family Brewers Shares Big Expansion News Sierra Nevada Acquires Sufferfest Beer Co.